My co-authors and I have been working diligently over the last 10 months creating what we hope will be recognized as a very important book, one that defines the true essence of “Continuous Improvement” and “Respect for People.” Kaizen Forever: Teachings of Chihiro Nakao shares the mindset that created Toyota’s production method and their overall management practice. There is no other book like this one. Chihiro Nakao is perhaps the foremost genba kaizen practitioner alive today with more than 50 years of experience. We have learned so much from him over many years of training, listening, and putting into practice what he taught us. 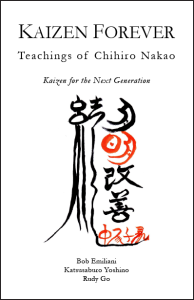 Nakao-san’s teachings have had such a great impact on us that we thought it was important to document his unique teachings for the next generation. Our goal was to capture the spirit and mindset of Toyota’s classic industrial engineering-based kaizen – the method that propelled Toyota Motor Corporation to the forefront with quality products, high productivity, low costs, and high profits. It seems, however, that in recent years people have lost sight of kaizen and its importance in developing people and improving products. We wish to reconnect people to genba kaizen and generate renewed enthusiasm for it. Nakao-san’s teachings are truly incredible. Just when you think you understand the meaning of something, you discover a new layer of meaning. Just when you think you understand the interconnections, you discover a new interconnection. Even people who think they know a lot about kaizen will learn many new things from this book. This book will be extremely helpful to anyone involved with kaizen regardless of the industry they are in – whether manufacturing or service, for-profit or not-for profit, private or public enterprise, government or non-governmental organization, public or private education (any level). Competition in business must have the positive effect of strengthening people through creativity and innovation. Kaizen builds human capabilities in response to competitive challenges. Kaizen Forever introduces you to the teachings of Chihiro Nakao. Nakao-san co-founded the Shingijutsu Company in 1987 at the behest of Taiichi Ohno to teach the principles and practices of the Toyota Production System to a wider audience. Nakao-san’s teachings will enlighten you on wide-ranging subjects related to business, management, leadership, and more. He does so in ways that nobody else has, and as no one else alive can. This book will make a deep impact on you in practical, intellectual, and emotional ways. It will inspire you to think differently, to be practical and take action, and to learn and improve. There is no end to kaizen. There is no end to what you can learn from this book. Kaizen Forever is available only in print so that your interaction with this important book to be as tangible as the practice of genba kaizen. Learning should be hands-on, with readers marking up the pages and taking extended notes with their own thoughts and observations, and apply what they learned at the genba. We hope readers will return to the book and their annotations many times in the future to deepen their understanding of Nakao-san’s teachings, and always return to the genba. This book must be top of the line information… I say this because I was a student of Chihiro Nakao. He was one of three instructors from Japan that studied under Taiichi Ohno. Mr. Nakao, along with Mr. Yoshiki Iwata and Mr. Akira Takenaka, came to Bloomfield, CT to the Jacobs Manufacturing Company back in the 1990’s and they taught us managers kaizen which Jacobs implemented under their direction. Over the years I studied under many other instructors but it was the ones from Japan that studied under Taiichi Ohno that taught the most successful methods. I took my knowledge and experience to the classrooms of Asnuntuck Community College and I taught the Shingijutsu philosophies as an Adjunct Instructor. Just finished reading (several times) the book and the first thing that struck me is the incredible amount of wisdom concentrated in 98 pages. The second thing was – although the subtitle is Kaizen For The Next Generation – even the older generations have a lot to learn from it. Just an example: when Nakao-san says “Master the basics” doesn’t it trigger the automatic question: “What are the basics?” Now try to find that answer from the ocean of Lean literature out there. The pertinence of each of the phrases cited in this book is backed by the fact that it comes from the one that actively participated in one of the most successful Lean transformations to date. Thank you, Bob. This book helps concentrate on the right things!